Available in Fire-rated on Single Doors. Wood, being a natural product with its own unique character, color and grain patterns can vary even when taken from the same tree. Various species, particularly Rotary Natural Birch display a very irregular grain pattern that is accentuated by the presence of light colored sapwood permeated by much darker heartwood. The extreme difference in coloration may be highlighted or subdued when the door face veneer is finished and should, therefore, be considered before purchasing Natural Birch. Actual colors and grain patterns may vary from what is pictured here. If you’re looking for a solid wood door with a frame built to fit, we can help! Doormart USA offers commercial solid wood doors and frames, which are supplied as a 16GA hollow metal frame with a 1 3/4" solid core birch wood door. Select whether a knock down or welded frame is most suitable for your needs. Our wood doors are available with either cylindrical prep or hinge prep only, to make installing your door and hardware a simple task. 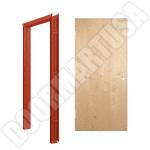 We are also able to offer solid wood doors and hollow metal frames with a fire rating. For applications needing double entry doors, such as busy office or commercial retail environments, you have the option of either knock down frames in single or double options or welded frames also in single and double variations. Each comes complete with a pair of solid core birch wood doors, prepped for hinges only, or as active and inactive doors. 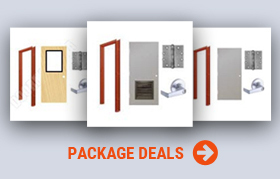 Doormart USA is proud to serve commercial contractors & wholesalers with fast delivery and the lowest prices around. 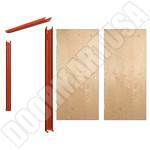 Doormart USA can help you fill virtually any large-quantity commercial door and hardware order. We specialize in providing you with the products you need at the prices you want.